As well as being part of beautiful garments and accessories, ikat designs are appearing in wallpapers, carpets, stencils and furnishing fabrics. There are traditional bold patterns and strong colours and some of the new pieces are pastel wash-outs, that look very pretty. New York-based textile designer and painter, Madeline Weinrib has collaborated with Ferghana Valley ikat weavers and thread dyers for years producing contemporary, bold designs. She has written an interesting article in Hand/Eye magazine describing the pleasures and challenges of creating the fabrics in Uzbekistan. As she writes "There is no other place where you can find masters with the capability to make these beautiful fabrics. We feel we are creating beautiful, useful things and keeping a tradition alive while providing a living to so many people there..."
Of particular interest in that article, unfortunately not online, is a note that "A certain museum in Tashkent (which shall remain nameless) sells our rejects..." I will be in Tashkent shortly and will certainly track it down! 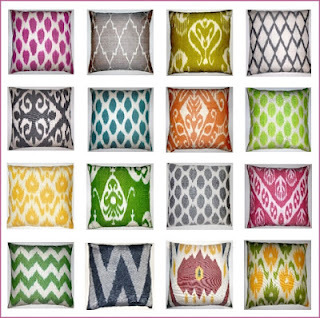 Weinrib's collection is beautiful and she deserves kudos for introducing ikat into contemporary interior design. 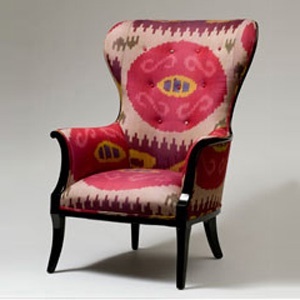 Generally Uzbek ikat is woven in widths of 38 to 50 cms, so it can be tricky using it as upholstery as seams may show. For pelmets, curtain trims and cushions, however, it is perfect, adding a definite accent to a room. 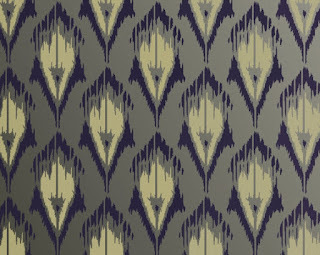 Ikat wallpapers are now available commercially and can be attractive as a feature wall. Etsy shop Olive Leaf has gorgeous, reusable ikat wall stencils. Created from original hand-drawn artworks, they are transferred and precision cut into durable, easy to clean, clear plastic. Olive Leaf states that each stencil has been designed to ensure a fun and simple project that could be completed in an afternoon by the novice DIY enthusiast. Although Uzbek Journeys tours do not visit the Ferghana Valley, you certainly will see silk ikat weaving and have the chance to purchase fabulous fabrics, including silk velvet ikat, in Samarkand and Bukhara. Excursions from Tashkent to the silk centres of the Ferghana Valley can be arranged pre- or post-tour. View the choices of art and craft Ferghana Valley tours.